Messaging apps are coming into their own these days; BBM, Google Voice, Apple’s iMessage, Facebook Messenger, etc. 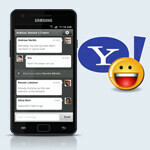 Now Yahoo, never a company to pass up a chance to arrive late to a party, has released a beta version of their Hub messaging app on the Android Market. Hub will support group chat, push notifications, and of course the ability to send SMS texts to your friends for free, even if they don’t use Hub (of course those friends can be charged for receiving your texts, so there will be an incentive to attract users). Messaging is getting to be a crowded field, but controlling the messaging platform is an important window into a user’s social graph, so trying to get your grubby software paws onto that data has become all the rage. It’s ultimately good for consumers – smartphone users have many competing options for group messaging and free texting services now. Carriers won’t like seeing these threats to their texting cash cow, but the reality is that SMS charges are marked up several thousand times compared to the amount of data they use, so few people will shed tears of sorrow for them. Anyone plan to try out Hub? Let us know what you think of it in the comments below. competition is good but its kinda hard to compete against someone as good as GOOGLE !!! Not that hard..IM+ seems to out them all. I'll stick with my trusty gchat!